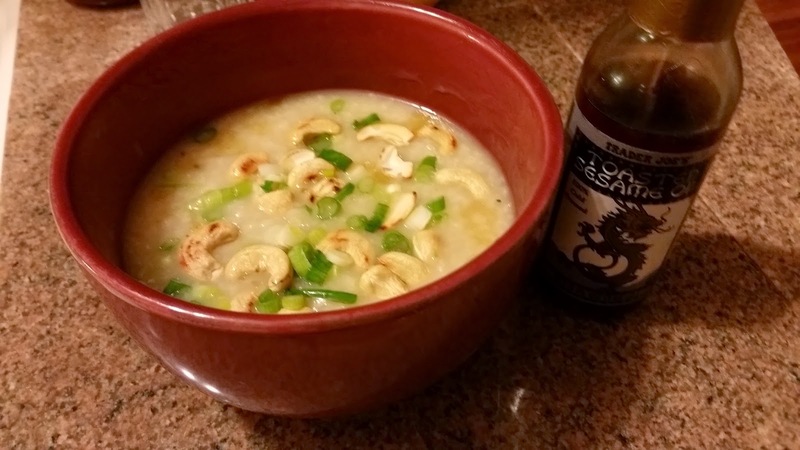 I was having a little trouble figuring out what to post this week, but then my friends at yourfoodchoices.com posted a beautiful whole grain congee with made from scratch chicken broth, Mei Lin won Top Chef with a congee, and my sinuses really started acting up. Given all these signs and the upcoming Lunar New Year, it seems to be time for some comforting, healing Congee/Jook! Congee is one of a few names for a traditional Chinese rice porridge, sort of the equivalent of chicken noodle soup. I call it Jook, the Cantonese name, in honor of the ESL students I teach in SF's Chinatown. It's perfect for breakfast, lunch or dinner, a snow day, a sick day, or just any time you want some comfort. 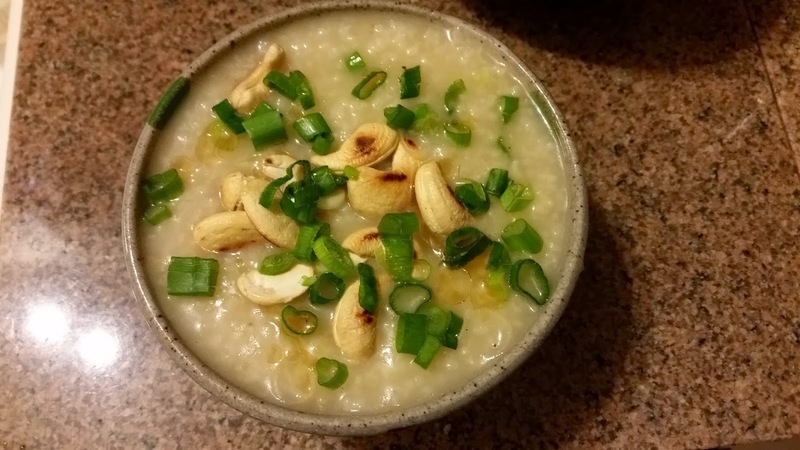 Jook can be made with pork, beef, abalone, hundred-year eggs, or just about anything. 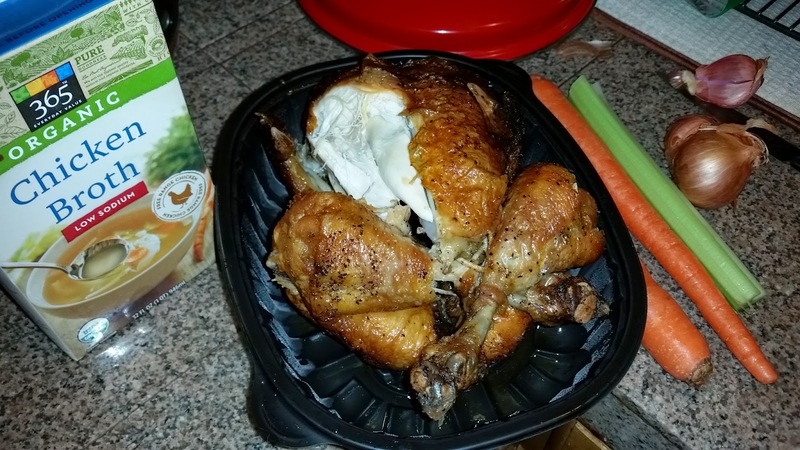 If you like to buy rotisserie chickens, it's a great way to use the bones and a good amount of the meat. 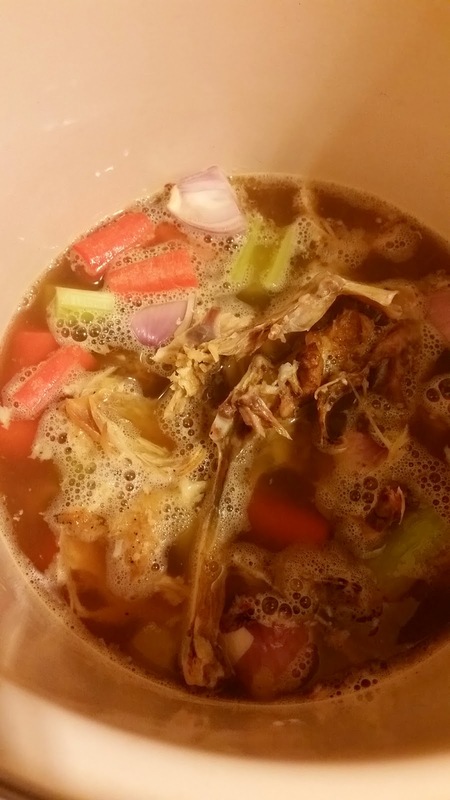 You can use broth, water, or a combination of the two. I use a combination. Busted! I can't help but eat a piece of the chicken while it's still hot and yummy. 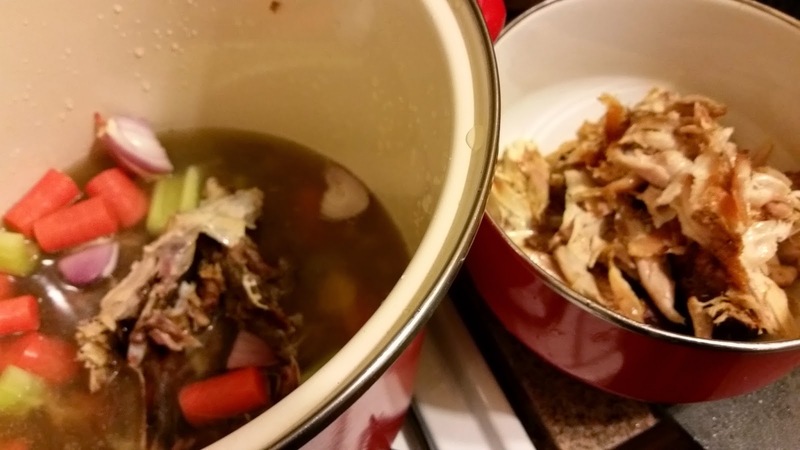 It's best to make broth from scratch. But if you aren't feeling so hot or you have a busy weekend, you can cheat a little with a 32 oz box of low-sodium chicken broth. Be sure to get the low sodium, not the reduced sodium. As of the last time I checked, Whole Foods and Trader Joe's carry it for the same price. Remove the meat from the bones. Shred half the meat for the congee and set aside the other half for sandwiches or chicken salad. Roughly chop two carrots, one stalk of celery and one small onion or large shallot. Add to a large pot with the bones and broth. Starting on low heat and turning it up after a few minutes, bring to a boil and reduce to a simmer. As the broth comes to a boil, you'll start to see some white foamy stuff. This is OK. If you see grey clumpy stuff, be sure to strain or spoon that off before it breaks up into the liquid again. This is schmutz from any bad stuff that might be in the chicken, and you don't want it in your Jook. It's not the end of the world if you miss some, but get as much out as you can. Simmer for 30 min to 1 hour. Strain the broth into a 5 to 8 quart pot. 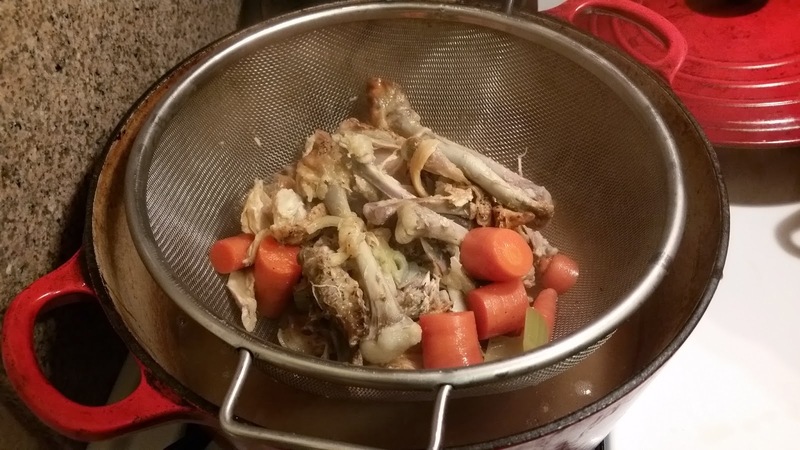 Compost the bones and veggies (or compost the bones and mash the carrots with a little salt and butter for a chef's snack). 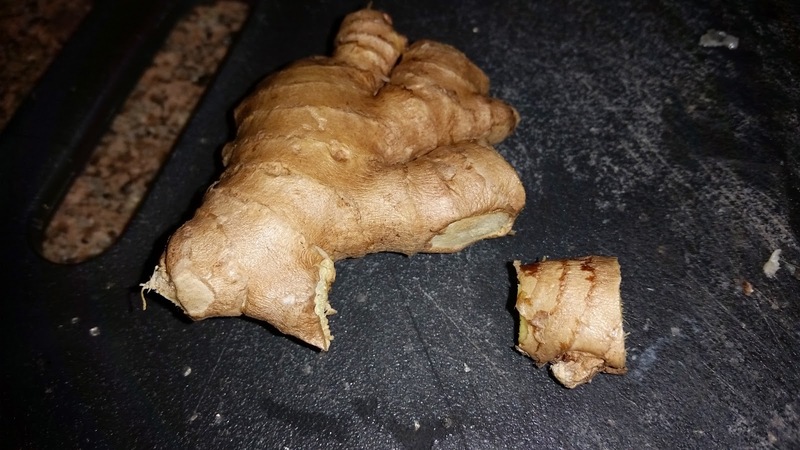 Add a one-inch piece of ginger. You can peel it if you like. I find it easier to find and fish out if the peel is still on. 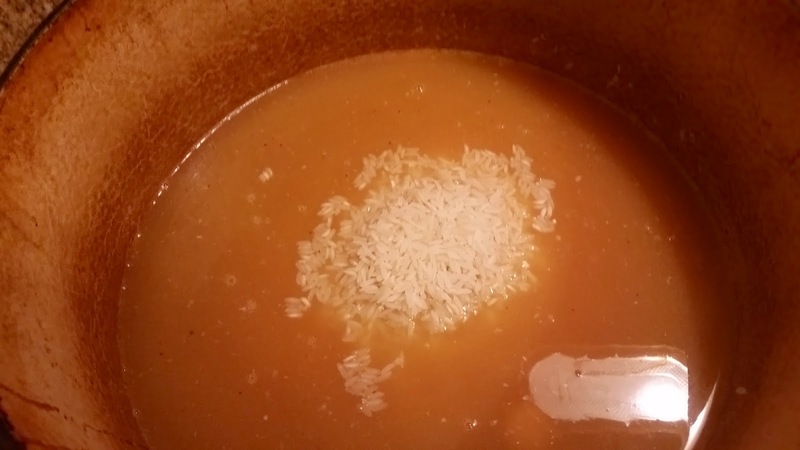 Add one cup of long grain white rice. Short grain rice will make it gummy. If you prefer brown rice, add 15-30 minutes to the cooking time. Add six cups of water for a total of 10 cups of liquid. Bring to a boil and skim off as much of the white or gray foam that rises to the top as you can this time. Simmer for 90 minutes, stirring occasionally. If you're wondering if you read that right, yes, that was 10 cups of liquid to one cup of rice! The rice will break down a bit but give a nice texture to the dish. After about 60 minutes, check for salt. If you think it needs it, stir in 1/4 tsp at a time, checking after each addition, until it's just right for you. Then, prepare your condiments. My favorites are scallions and cashews. Chop one scallion (green onion) for each bowl you plan to serve. I've chopped four to set some aside for tomorrow. 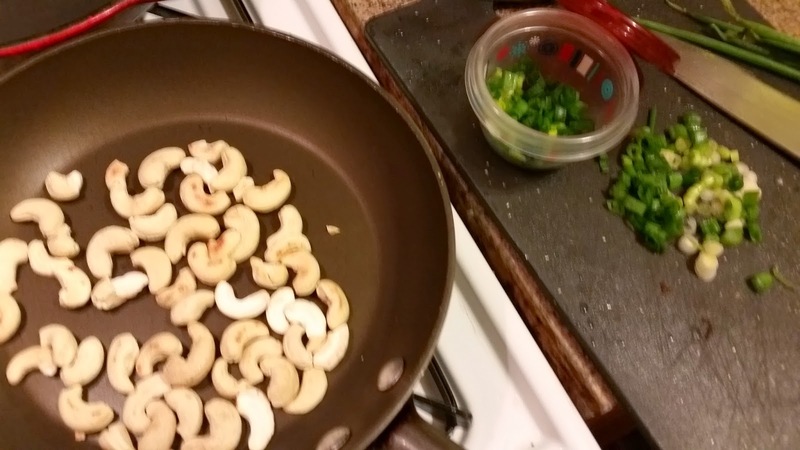 Toast some raw cashews or peanuts in a dry pan over medium heat for a couple of minutes until they get some brownish spots and give off a light fragrance. Other possible toppings include cilantro leaves, a soft-poached or hard-boiled egg, fried shallots, Chinese sausage, pickled ginger or radish, or rousong (a yummy pork product - I won't gross you out with the English name). Put some of the shredded chicken into each bowl you're serving. Ladle the Jook over the chicken and sprinkle with cashews, scallions and a drizzle of sesame oil.